I think it was John who taught me the idea, "things that can't go on forever, don't". Demography is a pretty good example of this. A lot of ink has been spilt in the last hundred years agonizing over both why too many people are being born, and too few. I'm not aware of anyone who has managed to do conspicuously well predicting the future. We don't even do that well with the past. That indeed looks just like what John said. This tickled my memory, and I remembered an offhand comment by Steve Sailer. Think of this from the perspective of the Malthusian Trap. Europeans already tended to voluntarily keep their populations below Malthusian limits by practicing the moral restraint that the Rev. Malthus famously advised in 1798. From 1200-1800, the average age of first marriage for an Englishwoman was 24-26. Rich women tended to marry at younger ages, poor women at older. Illegitimacy rates were in the lower single digits. Thus, due to this sexual restraint, Europeans tended to be in a less Malthusian situation than, say, the Chinese, who tended to marry younger. Consequently, Europeans tended to be richer while working less hard than the Chinese. If the European population didn't grow as fast during good times as the Chinese population did, they didn't experience quite as many vast die-offs from famine during times when good government broke down (e.g., as recently as the early 1960s during Mao's crazy Great Leap Forward). England, for example, hasn't had a major famine in over 600 years. You could generate a similar chart for the English data. We have to make educated guesses about populations before modern census techniques. Some of the methods are quite clever, but as an educated layman, I have no opinion on which method might be best. Demography matters, but you should probably take everyone's predictions lightly. Patrick J. Buchanan is a gifted polemicist. He runs for president occasionally, the better to explain to the people why America is going to hell in a hand basket. In this book, the hand basket has grown to encompass the whole of Western Civilization, plus Japan and Russia. The arguments he presents are not new; after a long hiatus, people all over the world are starting to make them again. Though Mr. Buchanan would deny it, what we see here is an old-fashioned patriot starting to move beyond mere patriotism. "The first is a dying population. Second is the mass immigration of peoples of different colors, creeds, and cultures, changing the character of the West forever. The third is the rise to dominance of an anti-Western culture in the West, deeply hostile to its religions, traditions, and morality, which has already sundered the West. The fourth is the breakup of nations and the defection of ruling elites to a world government whose rise entails the end of nations." Let us consider these horribles in turn. Dying Population: This thesis has attracted most of the attention the book has received, though only two of ten chapters are devoted to it. In a world in which two generations have been raised to think of overpopulation as the greatest threat to human survival, the revelation that it is possible for societies to have too few children still has considerable novelty. Nonetheless, it is true. The problem with the Social Security system, to take the most obvious example, is not federal fiscal practices or how the Trust Fund is invested; the problem is that there are fewer young people to support the growing percentage of old people. The implications go beyond the question of how the elderly are to be cared for, however. For a modern population to sustain itself, its women must produce 2.1 children on average. This "zero-population-growth rate" is roughly that of the US today (it's actually on a pronounced uptick, including for native-born whites). In Europe and Japan, however, the rate is far below replacement. If you define Europe as the region from Iceland right across Russia, its total population in 2000 was 782 million. Absent immigration, however, and at its current fertility rate, that number will fall to 600 million by 2050. Take a specific example: if Germany maintains its current fertility rate of 1.3%, today's 82 million Germans (as distinguished from Germans plus immigrants) will be a mere 59 million in 2050. And a superannuated crew they will be, with one-third of them over 65. If you run the numbers to the end of the 21st century, Germany shrinks to 38 million. The most interesting thing about this argument is that it is a revival. Popular jeremiads on the perils of population decline appeared in the 1920s and 30s, and indeed before. 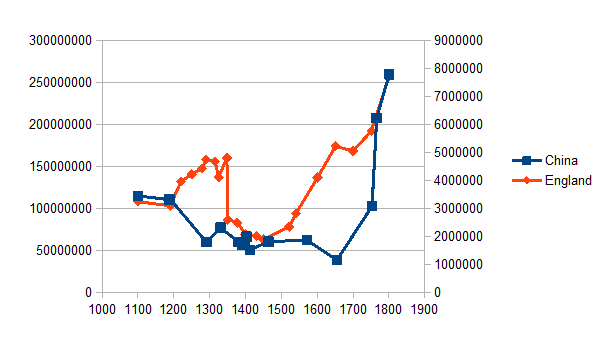 The deceleration of growth in Western populations goes back in some regions to the 1760s. The United States fertility rate first fell below replacement level, briefly, in the 1930s. That was also about the time the trend started to reverse in the West in general, at different times in different countries. The beginning of the famous Post-War Babyboom in the US is sometimes actually dated to 1943. Warnings about declining fertility took a rest until the 1980s, by which time most of the West had fallen below replacement levels again. One does not quite know what to make of all this. As Mr. Buchanan points out, no demographer expects another babyboom. On the other hand, no demographer expected the 20th century babyboom, either. One request that I wish he had made of his friend at the UN Population Division, whom he thanks for sending him all these glum statistics, would have been for a set of population projections from fifty years ago and earlier. I guarantee that you could not have extrapolated the world of 2000 from the trends of 1950, or foreseen 1950 from 1900. The figures for 2050 are at least as misleading. Mass Migration: Like most white ethnics, I cannot read arguments against immigration without reflecting that native-born Americans had similar suspicions about my own ancestors. (Having met some of those ancestors, I also reflect that the native-born had a point.) The early 21st century surely is different, however, especially for Europe, which now imports rather than exports people. In large part, the people in question are Muslims, alien in culture and religion to their host countries. Assimilation would be difficult even for societies used to immigration, and whose leadership understood the importance of incorporating the newcomers. Neither is true of most of the West. Guided by cultural relativism, governments often hinder assimilation, even when the proven result is intercommunal riots. Again, while demographic projections should be taken with a grain of salt, immigration by Muslims with high fertility rates really could Islamicize much of Western Europe in the 21st century. In the United States, the object of Mr. Buchanan's single-minded ire is what he calls La Reconquista of the Southwestern United States by Mexico, or at least by Mexican immigrants. If you really need to be afraid, there are many frightening sources to quote. Mexican commentators sometimes speak about the peaceful reversal of the outcome of the Mexican-American War. Additionally, there is a fashion among Mexican-American radicals for proclaiming the formation of a new nation called "Aztlan," as well as a lot of Chicano blood-and-soil racism. None of this is terribly obscure, but the media leave it studiously unmentioned when discussing immigration and bilingual education. Still, as the case of California suggests, there is less to this than meets the eye. That state no longer has an Anglo majority, but it does have an Anglo plurality, a group that is likely to grow when the economy picks up and people move back. In any case, the fastest growing immigrant group in California is not Latin but Asian. History suggests that immigration need not be good for secessionist movements. Quebec in the 1970s seemed likely to secede from Canada, but the immigrants who voted in the referenda on the issue insisted on preserving the state to which they had immigrated. It is fallacious to equate a change in ethnicity with a loss of national territory. Certainly it is not clear that assimilation is a lost cause. The percentage of Spanish-speakers in the US today is comparable to that of German-speakers around 1900. Today, all that is left of the little Germanias of the Midwest are breweries and Von Steuben Day parades. Through marriage and adaptation, immigrants to the US have a continuing history of breaking out of their ethnic and linguistic cubbyholes. Culture War: Pat Buchanan is sometimes blamed for starting the Culture War, since he used the term in his fire-and-brimstone address to the Republican National Convention of 1992. In point of fact, it is not controversial that the cultural Left has at every point been the aggressor in this conflict. The Cultural Revolution of the 1960s combined century-old bohemianism with an anti-Americanism pitched to the defense of foreign Communist regimes. These elements never mixed well, and the author recognizes that his attempt to describe the phenomenon as a coherent product of the Frankfort School is perhaps incomplete. Still, when the promising young people of the 1960s moved into positions of authority in the 1990s, they did tend to bring with them a homogenizing intolerance to tradition that masquerades as enthusiasm for diversity. This critique is familiar, and "The Death of the West" does not add anything to it. The book does make the somewhat novel charge that the Cultural Revolution disables the West from addressing its demographic challenges, or even acknowledging they exist. Importing and subsidizing a foreign culture is a very efficient way of displacing tradition. In the US, the Left uses it as a way to circumvent the reactionary native electorate. Mr. Buchanan is audibly unhappy that Hispanic immigration to the US broke the electoral lock on the presidency that, in the 1970s, the Republican Party seemed likely to enjoy forever. Culture War is linked to demographics in other ways, too. The growth of large Muslim minorities makes it easier to remove Christian symbols and rhetoric from public forums. (The Muslims themselves often don't ask for this, incidentally, but secularizers can still act in their name.) The biggest single connection, though, is feminism. Whatever its intent, the effect of feminism over the past 30 years has been anti-natalist. Western societies find themselves in the odd position of giving priority to a class of human rights whose exercise seems inconsistent with the continued existence of humans. Though these are serious arguments, they are somewhat spoiled by the odd set of traditions in whose behalf Mr. Buchanan seems most eager to wage Culture War. Not a Confederate battle flag can be ordered removed from a state house in the Old South without Pat Buchanan knowing and caring. Do we really miss much by losing "Dixie" as a national song? And while there is some merit to the idea of abolishing President's Day and re-instating Washington's Birthday, the author sees none in a federal revival of Lincoln's Birthday; Abraham Lincoln was "an absolute military dictator." World Government: The number of influential people for whom world government is an actual policy goal is fairly small, though a growing fraction of political theorists think it is inevitable. Certainly it is easier to imagine now than during the Cold War. For the purposes of "The Death of the West," however, world government seems to encompass any restriction on the behavior of the governments of nation states, a class of polity that ideally encompasses a single people, culture and language. Thus, the threat of world government means not just expansion of the UN system to include mandatory criminal jurisdiction in human rights cases; it also includes the mere existence of the "superstate" of the European Union. "World government" means NAFTA, and indeed any multilateral trade agreement, particularly those with mandatory arbitration mechanisms. Again, the author has a point: international bureaucracies often do bad work, and they have an exaggerated sense of their own importance. On the other hand, like many American conservatives, he never quite grasps the fact that world government is much more something the United States does than something that is done to the United States. Hegemony is arguably a bad situation, and not least for America's republican institutions. Still, would a total lack of international government really be better for anybody?